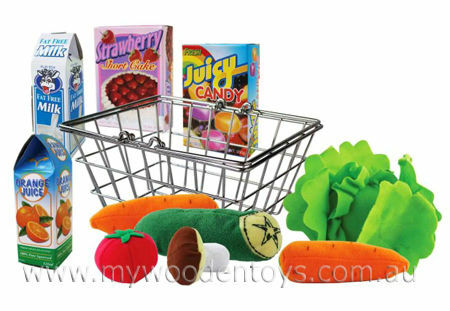 Shopping Basket Food Playset is a metal shopping basket, just like the real ones, filled to the brim with fabric vegetables and some very realistic cardboard cartons. This set has ten different food items and a very strong metal basket with folding carry handles. This is a great set for all those shopping roleplay games and there are many learning opportunities including reading the writing on the cartons as you shop. We really like how four of the lettuce leaves can be pulled off as they have velcro on them. The whole set packs away neatly into the basket ready for the next days shopping. We like this because: "Shopping basket just like the real ones."